Enhanced environmental performance and improved polymer and, hence, yarn quality: these are the main objectives set for the new lactam wastewater recovery plant installed at the RadiciFil production site in Casnigo (Bergamo) during the course of 2018. The production facility specializes in polyamide 6 polymerization and BCF yarn production, the core business of the RadiciGroup Performance Yarn Business Area. The new plant, which has recently undergone a test run, recovers the wastewater from the polymerization process with a caprolactam concentration of 8-12%. Using falling film and mechanical vapour recompression technologies, the plant processes the water, so as to raise the caprolactam concentration in the output up to 80%, thus making the recovered caprolactam suitable for reuse in continuous cycle polymer production. “This investment has taken advantage of some of the benefits provided by Industry Plan 4.0”, said Nicola Agnoli, CEO of the RadiciGroup Performance Yarn Business Area, “and is part of the company production plan. The system incorporates the latest developments in technology, which allow it to reduce the quantity of heat energy used and will help us achieve the EU 2020 goals (ETS) concerning CO2 emissions. The new plant has already proven effective in achieving a noticeable reduction in the quantity of natural gas used for steam production, as well as a generalized improvement in the quality of the output product. The quantity of steam needed for the lactam wastewater recovery process in the new system has fallen by about 80% (the pressure being equal) compared to the amount required for the old plant previously in operation. 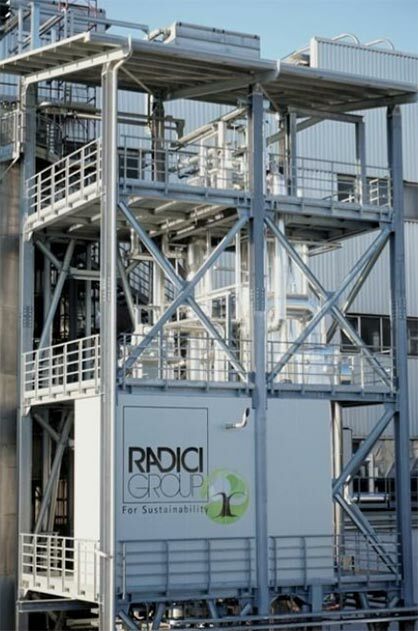 This reduction, in turn, has had a positive effect on RadiciFil’s overall performance: the consumption of natural gas needed for the operation of the entire production plant has dropped by about 35-40%. Another innovative feature of the new wastewater recovery plant lies in its ability to adapt to changes in production, flexibly adjusting to the variations in the lactam wastewater input load in a range from 60% to 100%.